An often forgotten error for many process maps is omitting the legend. This is strange, because this would never happen on a geographic map, but occurs all the time in process mapping. In this example, the TaskMap legend is posted on a web site, allowing even more detail of the main symbol in this model to be viewed. 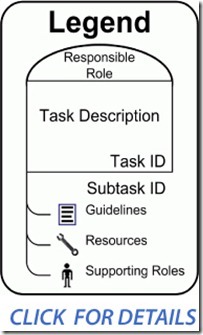 Additional information in the task shape model for responsible roles, task description, a unique Task number, guidelines and resources are all contained in the task shape. By dropping this shape on all the maps, readers have a short cut to see what the author intended. Regardless of the system you are using, you want your audience to understand your process maps. So add a legend every time you create one.